Life was complicated when it was just paper you had to worry about. Then we oldies only had our desk and “In Tray” to get organized – though even that was a daily challenge. Thanks to the digital revolution, we now also have stuff in multiple other places – the cloud, our phones, our computers, and our email. JPGs, PDFs, DOCs, MOVs, MP3s, HTML’s and XLS’s are coming at us from all directions. How on earth (or how in the cloud) do you keep track of it all? If only there was one place that kept everything – digital and paper. And if only it was easily searchable. Oh, and if I could access it from anywhere, that would be amazing too. I guess we’ll have to wait until the next Steve Jobs to design that though. 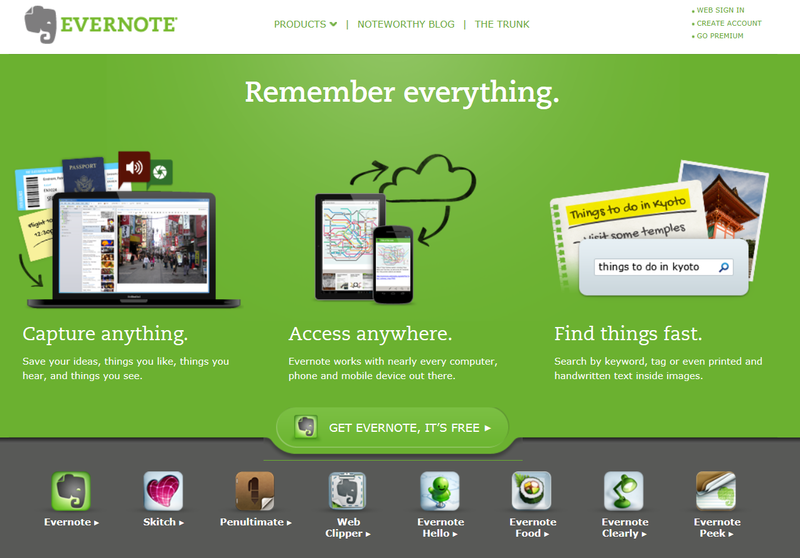 Do not despair, Evernote is here. The Evernote process is a really simple three-step process: Capture, Organize, Search. There are multiple ways of getting your information into Evernote using your computer, phone, tablet or email. Write notes: Very simple note-taking within the app – ideal for lectures. Upload: Upload files such as Word docs and pdfs – perfect for all the class handouts. Email: You can email documents and other files to Evernote via your own Evernote email address. Web clipper: When you come across any good blogs or websites, just click the Evernote web-clipper plugin button in your browser and it automatically saves it to Evernote. Photo: Take photographs of receipts, letters, menus, handwritten notes, anything really, and send it to Evernote by email or use the Evernote App for even quicker results. Everything you send to Evernote automatically goes into your Evernote Inbox. At the end of every day, or every few days, you’ll want to go in there and organize it all into notebooks. You might have one for each subject or area of your life (e.g. finances, Church, vacation, etc) and you can even have sub-notebooks within a notebook. You can also add tags for more detailed organization. Or you can take the next step in becoming an organizational ninja by doing the organizing as you go along. For example by using @English Lit in your subject line, anything you send to Evernote by email will automatically go into your English Lit notebook. Tags can also be added to anything you upload using the hashtag #. The web clipper allows this organizing as you clip too. So you’ve got into the habit of uploading, emailing, clipping, photographing everything into Evernote. Your desk is clear and so is your mind. All your paper and data are in one place. But now you need to search for a bill, or an assignment, or a blog article. Where did I put that? Open Evernote and start by searching in your Notebooks. Click on one to see everything you’ve ever entered there. Hmm, didn’t find it. Maybe I put it in another Notebook, but which one? What now? Dead easy. Go to the Evernote search box and enter a word or phrase that you think is in the document or file. It will then quickly search everything in your Evernote and list the matches. This for me is the most powerful feature of Evernote. Its search machine is unparalleled in speed and accuracy. It will even search for words on handwritten notes, photos of brochures and menus, etc. You can search via your desktop your phone App, or via the Internet if you are separated from all your devices. There are many other features and benefits of Evernote that you’ll discover as you go along. For example, you can share your notebooks or notes with others too. And here’s Tim Challies’ great tip on how to get your Kindle notes and highlights into Evernote. And like my previous two New Student Tips, Dropbox and Wunderlist, Evernote is also free and the free version should be enough for most students. However, I pay the small price of $5 per month for a premium account which allows me to access my Notebooks offline, improves searchability, increases my monthly upload limit and adds an extra layer of security if I need it. Sign up for Evernote here.